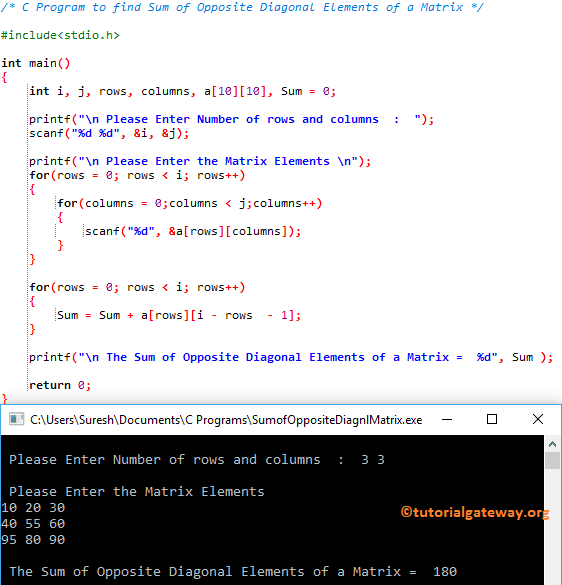 In this article, we will show you, How to write a C Program to find Sum of Opposite Diagonal Elements of a Matrix. Or How to write a C program to find Sum of Opposite Diagonal Elements of a Multi-Dimensional Array with example. This program allows the user to enter the number of rows and columns of a Matrix. 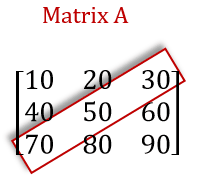 Next, we are going to calculate the sum of opposite diagonal elements in this matrix using For Loop. The condition (0 < 3) is True. The condition (2 < 3) is True. Next, rows value will be incremented. After the increment the condition inside the for loop (rows < 3) will fail. So it will exit from the loop. This program is same as above, but this time we changed the algorithm a bit.